An abuser of cybernetic technology, nanotechnology, and enhancement implants, Skipjack walks the fine line between human and machine. She was gravely injured by an explosion when she was a child which wound up replacing the entire left side of her body with cybernetic technology. She took to exploring the limits of technology to the extreme, eventually becoming the world’s most infamous cyberphile. 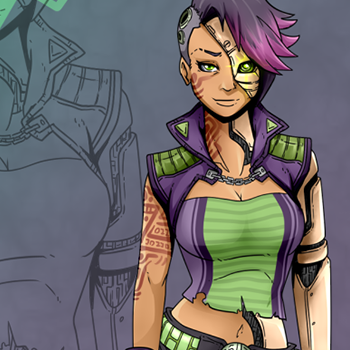 With her custom implants, Skipjack is able to access most any piece of networkable technology, making her the greatest hacker on the planet with the ability to control almost every element of technology she encounters. As a member of the villain group Leviathan, her unlawful practices has made her a wanted criminal, pursued by every branch of governing authority; something she regards with great pleasure. Though Skipjack’s body is mostly cybernetic, her limbs and body weren’t designed for strength, but rather functionality. She can plug herself into any networkable technology and even use her onboard network devices to control virtually any device she is close enough to. With her access to Leviathan’s technology, she has secured herself a small swarm of replicating nanobots she can controls with high frequency impulses. She uses them to restrain her foes with a dance party across her opponents’ bodies while she finishes the job with her small arsenal of personal weapons. She wields a pair of railgun pistols that charge rounds with electric energy she uses alongside her nanobots to create electromagnetic pulses across the victim’s body, causing massive damage to even the most heavily shielded electronics. Her nanobots can also infiltrate other computer systems, hacking them autonomously to give her access to nearby networkable weaponry such as turrets and robots. However, if her dirty tactics aren’t enough, she can form an energy field with her nanobots to shield herself from damage as she makes her escape. In a pinch, she activates her “Skipbeat,” where she puts her body into double overdrive, heightening all of her senses and reactions, which can easily overtax her organic side. In this state, her heartbeat doubles from 128 bpm to 256 bpm which her implants can only keep stable for a short time before her organic systems fail. Skipjack lives a dual life on and offline. Online, she is the powerful Skipjack, master of technology and bombastically outspoken against authority. She causes conflict “for the lulz” by hacking into impregnable fortresses of security with ease and posting their secrets online. She leaves signature silhouette of a dancer mark on any place she visits online to ensure everyone knows who the real mistress of the web is. Offline, she is a bitter recluse who shuns the physical world. She thinks of her online digital space as her “real world” since she is free to be her true invincible self there. The few that see her overlook her as a tiny, quiet, disfigured cyberphile. When she encounters someone who knows her as Skipjack, she puts up a confident front and will ruthlessly tear them apart with her machines. All of her life, Lindsey Kyleigh Akerman wanted to be a dancer. She pursued her passion relentlessly until Leviathan’s Uprising attacked her home city of London. She was at a dance studio at the time when the fighting suddenly broke out and a bomb destroyed most of the block she was on. The right side of her body was destroyed in the blast, but she survived by a miracle and was rushed to an ICU by JaxCorp heroes shortly afterward. Because of the massive damage to her body, she underwent experimental reconstructive surgery in San Ceilo by Cyber Assemblies as part of their Childlight program, a charity that helps children with damaged or destroyed limbs with the added benefit of making them lifetime customers. Doctors were able to replace the right side of her body with a large-scale cybernetic frame, integrating the cybernetic with the organic on a scale not seen before. A side effect was suppressing her growth hormones, but Lindsey was saved in the end. However, her dreams of becoming a dancer were shattered as she found it difficult not only to perform, but also to approach people seeing her as the first generation of cyber monstrosities. The world had become a terrifying place. She became a recluse, finding community and solace online with others like her. Where she had first hated her cybernetic parts, her cyberphile friends online helped her see the light of what superior technology could do in the right hands, or in her case the right half. She poured herself into exploring the extent of different technologies and implants with the same ferocity she had pursued dancing. She began learning advanced mathematics, cryptology, and security algorithms, learning she had great aptitude for learning them. Whether it was natural or from her cybernetics, she didn’t care. Lindsey began looking into upgrading herself further to give her even more of an edge. She went on a hardware binge, installing and upgrading everything that she could get her hands on, even replacing her eyes with two different cybernetic ocular implants. Doctors warned she could be destroying her body, but an explosion had already done the job years ago. By the time she was done, she had installed enough devices in her head that she lived and breathed in hexadecimals, even going as far to customize her firmware and create her own custom hardware designed specifically for hacking. To fuel her habit, she started contracted her services to the highest bidder, promising she could break into any network and do what her client pleased while having her own brand of fun with the silhouette picture of a dancing girl embedded into each network. Lindsey cemented herself online as the illusive Skipjack and reached the top of the food chain in the deepest crannies of the web. With her fame, she was hired to hack into the most dangerous web in the world, the Leviathan Network. It was the hardest job she’d ever done with the entire network a tireless struggle to crack. When she reached the other side, she had a direct connection to Magistor who revealed himself to be her client. He went on to explain what had started as a terrible curse had become her greatest gift. She was unparalleled in her field, the mistress of the entire Internet at her fingertips and he wanted her to be part of Leviathan. With the promise to create chaos across the world, she discarded Lindsey altogether and Skipjack joined Magistor without hesitation. Quotes "How the hell did you find me you… whoever you are?" "All it takes is a couple neurons firing and I can fry every computer in the room." "I would say back away slowly but umm… I think I’ll just shoot you."